If a historical study of culinary delights and delectable cuisine could be done a very convincing argument might be had that those delectable delights rest upon the backs of monks and nuns. 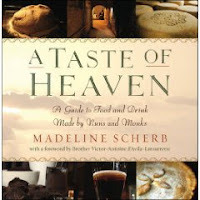 A Taste of Heaven: A guide to the Good and Drink Made by Monks and Nuns by Madeline Scherb, though part cook book, travel guide – as the inside cover promotes – contains bits of history of various foods and the monkish developments to those foods over the centuries. My favorite parts of the book, included the sections where the author gives a brief history of the various abbeys from where she draws her recipes and food, which often included a little gems on the abbey’s spirituality and daily routine. I say this mostly because I am a theology teacher who sometimes teaches church history, so this was a nice easy readable book, which I hope to share some parts with my students. Each recipe highlights one of the Abbey’s signature food. So if the Abbey is known for it’s beer, as is the case with Saint Benedict Abbey and many other monasteries in Europe, then the recipe will be Creamy Beer Soup, which includes Achel, the beer brewed by the monks at St. Ben’s near Achel, Belgium. Likewise if the Abbey is known for its cheese, as is the case with Postel Abbey in Mol, Belgium, then the recipe will include that Postel Cheese; in this case, the recipe was a Flamiche, which is a Belgiam quiche. No worries, the book also highlights several Abbeys in the United States, including Gethsemmani and the cheese for which they are known. Is it a must read? Well if you like cooking and trying new recipes the book is certainly worth reading as there are a variety of recipes of a variety of complexities from the simple only needing a few ingredients to the more complex that requires at least a working knowledge of the kitchen. Personally, I’m waiting for a nice cold rainy day to try the Creamy Beer Soup. Though she was silent about Affligem, my faviorite Belgium Abbey Ale, she covered a nice selection of foods that can be found in the US via certain national specialty stores, online, and Whole Foods. There is even a "shopping guide" that ends the book so you can be certain on where to find the specific food for which you are needing. Very interesting - I will have to buy the book. I go on retreat once a year to St. Joseph's Abbey in Mass. I believe there are some Trappist nuns in the same area who make candy. Food for thought > The New Milleray monks in Iowa make caskets. They are better than the ones you buy (for a fortune!) at the funeral parlor dealerships - and you can buy one for yourself now! The book sounds very interesting. Being a little short on cash, I'll probably ask the local library to order it for its collection; or try to make an inter-library loan. accompanied by a cheese sandwich made with cheese and bread made at the abbey. A priest sent this email to me and I thought you would be very interested in it. There will be a priest on Bobby Flay's TV Show Throw Down. All the details are below. I'm providing you some information about a Food Network Episode in which the Grace Before Meals movement will be featured. The show is called "Throw Down" with Bobby Flay. It will air on Wednesday 9 September 09 @ 9:00pm EST on the Food Network. The show's premise is that Bobby Flay, one of America's top celebrity chefs, surprises an unsuspecting chef to a "food cook off challenge." It's serious competition, even though it's a fun show. He seeks out people who have a certain claim in the culinary world and tries to beat them at their own game. So, I was rather surprised (and honored) to be challenged by such a great chef, especially since I have no culinary claim! At this point I am unable to tell you who won this competition. BUT, I can tell you that my partner in crime was none other than Rev. Msgr. Christopher Nalty, who came to support me during the taping; but, I put him to work! The show also featured the celebration of Mass, people praying, seminarians serving food while interacting with positive Catholic families, and even people praying the Rosary during the judging. We're confident this will be a positive media opportunity for our Church to dialogue with a world that doesn't hear the Lord calling them to His Supper. If you're in the Baltimore area on that day, the Archdiocese is discussing an event, possibly a block party, to celebrate this fun and faith-filled show. If possible, can you please put an announcement of this in your parish bulletins and encourage your parish families to watch this. Just spread the word far and wide - blogs, pulpit announcements, even having a possible supper party with your parish on that day! The Grace Before Meals movement tries to strengthen the Domestic Church around the dinner table, as the Universal Church is strengthened by gathering around the Lord's Table. I believe your parishioners may benefit from this message and also enjoy the show. AND, if this is something they enjoyed, tell them to write the Food Network letting them know to have more shows like this. This would encourage the network to continue providing good shows with a positive message, like this particular episode.